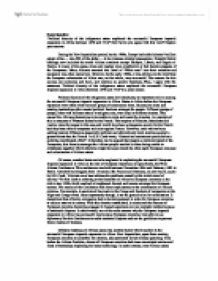 Essay Question: "Political disunity of the indigenous states explained the successful European imperial expansion in Africa between 1870 and 1914" How far do you agree with this view? Explain your answer. During the New Imperialism period, by the 1900s, Europe had added almost 9 million square miles - one-fifth of the globe - to its overseas colonial possessions. Europe's formal holdings now included the entire African continent except Ethiopia, Liberia, and Saguia el-Hamra. In many of the states, rulers and leaders were overthrown or had become puppets of the Europeans. Many Africans resented this flood of "White men" into their countries and resistance was often carried out. However, by the early 1900s, it was obvious to the world that the European colonisation of Africa was, on the whole, very successful. The reasons for this success are numerous and have, and continue to, puzzle historians. Thus, I agree with the statement "Political disunity of the indigenous states explained the successful European imperial expansion in Africa between 1870 and 1914" to a small extent. ...read more. Cook, "alleviate or at least address the problems raised by this initial round of activity." To this Cook is referring to the Scramble of Africa by European countries in the mid to late 1800s which resulted in heightened discord and tension amongst the European nations. The results of the Conference had direct implications to the colonization of African colonies. For example, it sanctioned free trade in the Congo and freedom of navigation on the Niger and Congo rivers. Most importantly though, it set the ground rules for colonization. It determined that effective occupation had to be demonstrated in order for European countries to claim a state as its colony. With this doctrine established, it minimized the chances of European countries becoming engaged in heated arguments or even outright warfare because of territorial disputes. In other words, one of the main reasons why the European imperial expansion in Africa was successful was because European countries were able to use diplomacy like this Conference to settle territorial disputes and set the guidelines to prevent future clashes of interests. ...read more. Even if patriotic and religious appeals of African leaders managed to rally scores of thousands, it was often not enough to hold back the tide of European invaders. Tens of thousands of African and Arabs united under Abushiri in East Africa were crushed by German forces while in South Africa, the united and numerous Boers were defeated (though with much difficulty) by the British. Simply, these under-armed men were just no match for the superiorly armed European soldiers. The West African Conference is also not convincing as a main reason because it merely set the guidelines for colonization for European countries to follow. As S.B. Cook argued, "the wholesale partition of Africa did not result from the Conference but from... incremental occupation." The ground rule for a colony to be recognized was that it be effectively occupied by Europeans. This again was often achieved through military force. Thus, I believe that the European expansion was successful because the Africans lacked the military and technological might that the Europeans had. Vast numbers mean nothing and resistance without supplies or weaponry is futile in modern warfare. ?? ?? ?? ?? ...read more. One has to believe that the High Contracting Parties understood the fundamental nature of citizenship in redefining the nature of the Union -- and it is this understanding, rather than misunderstanding which lead them to the desultory Article 8. But why, then, open Pandora's box at all? He tried to encourage democracy in England and then went to America where he possibly had a hand in writing the Declaration of Independence. He responded to Burke's opinions written in Reflections on the Revolution in France by writing a response titled Rights of Man. There obviously would also be a shift in the European Union borders and the former Russian states asking for European Union admission, which leads to the threat of eastern powers. Unemployment issues European Union unemployment is about 10% and the Eastern European countries would obviously increase these. For example Indians had their self rule Indian would not give their money to Britain. So then they would not have to face high payment of food and more people being poor. Kenyans didn't want to make or grow crops for the white farmers which black got low wages. Belgium has a highly developed, technologically advanced and completely telephone system with a nationwide cellular telephone system mostly using extensive cable networks. It has 87 radio stations, 24 TV stations and 57 Internet service providers. This makes marketing the product very accessible. Boots has several stores in France and Spain. Treaty of Maastricht Maastricht is perhaps the best known and the most controversial of the European treaties, Maastricht is officially known as the treaty of the European Union and with it came the EU into existence for the first time.